That's always the first thing you slice when it comes to using new kitchen tools that cut, right? I had a giant sweet potato and thought it would be the perfect thing to try to cut. 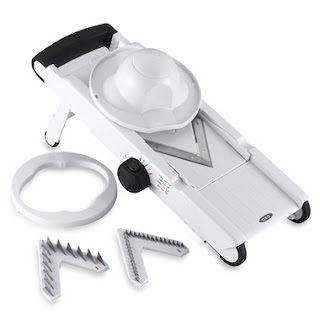 There are four blades included with the unit (a straight slicer, a crinkle cut slicer, large julienne and small julienne) and they are conveniently stored in the unit itself. Each slicing attachment has the ability to have it's height adjusted, too. I thought I'd try out the crinkle slice for the sweet potato and make some chips. Well, let's just say that the mandoline didn't like how big my sweet potato was. I tried it out with some regular white potatoes and it worked great though! The white potatoes turned out great! was so big and dense that it only gave me half pieces. setting to even cut the potato! Overall, I'm very happy with my latest choice of kitchen gadgets. I have to keep it in a box on a shelf because it's super sharp and I don't want my little guy to go exploring, but I plan on using it quite a bit. (I'm sure the next thing I'll try out is slicing some zucchini). I'd highly recommend a mandoline for anyone who wants uniform, quick cuts for cooking. Just be sure to always use the guard so you don't lose any fingers. My own personal lesson learned: definitely be sure to use fruits and vegetables that are less than 3 1/2 inches in diameter!